Yesterday I talked about how Carrie Fisher, Star Wars, and Star Trek have had a huge impact on my life. 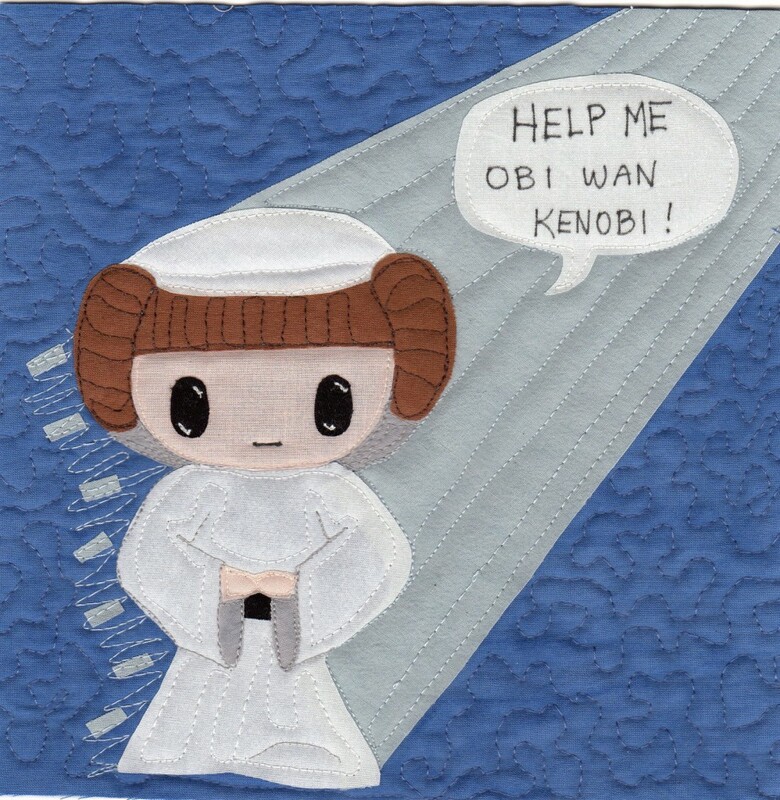 I shared some crafts you create yourself with Princess Leia as the center. Today I am going to share some of my favorite Princess Leia art I have seen over the years. My favorite art I have seen is a set of two quilts by Cheryl Sleboda. 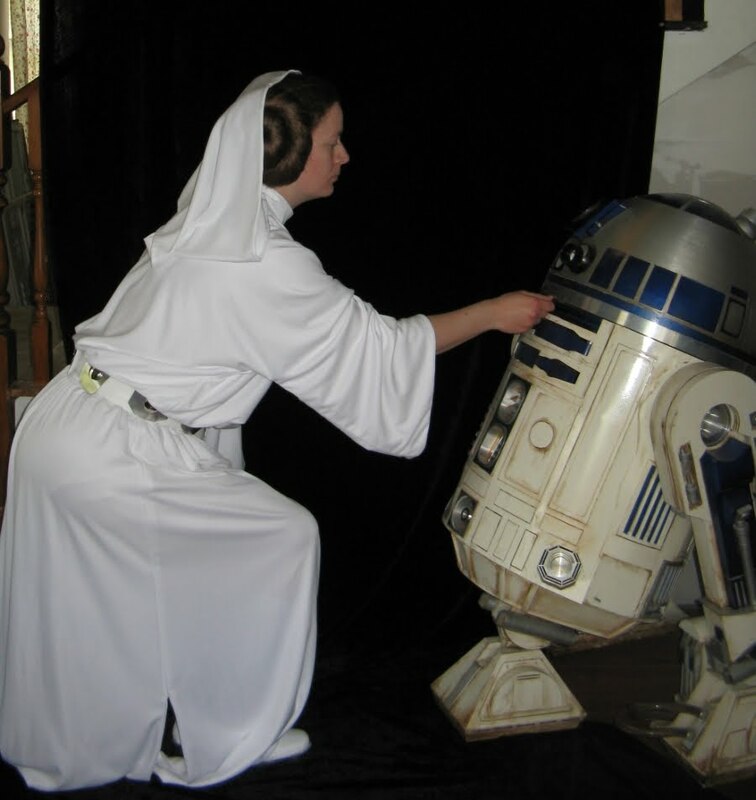 She captured everything I love about Princess Leia. 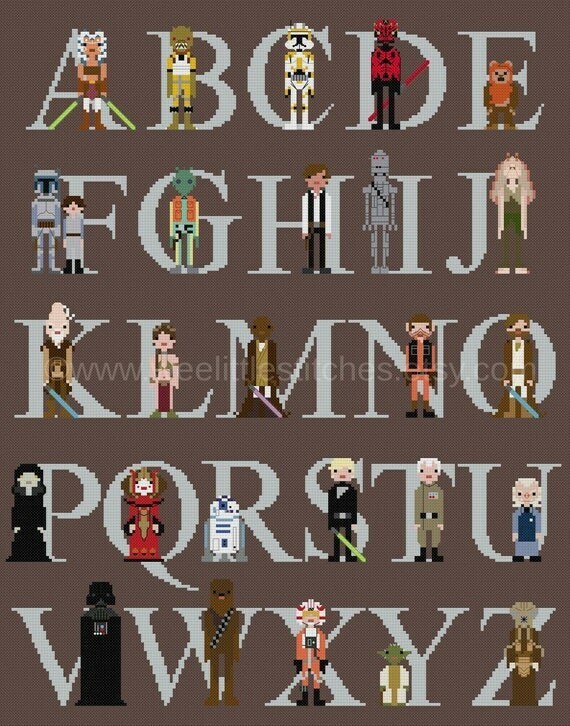 Wee Little Sitches (my FAVORITE Cross Stitch pattern maker) created some amazing Leia patterns/prints through the years. Finally Cosplayer Elizabeth Rage created this gorgeous dress. This is how I see and remember Leia. You will live forever in my heart Carrie. I was born in 1976, 1 year before Star Wars and 3 years before the Star Trek movies. I looked up to the people in both lines and idolized them. My parents would make sure that we saw every Star Trek and Star Wars movie in the theater when it was released (yes, even when I was very little and didn’t understand what was going on). I loved both Star Trek and Star Wars. I remember when I was 6 I saw that Larva crawl out of Chekov’s ear and I had nightmares for weeks. But I loved every minute of it. I grew up learning it didn’t matter what race you were, everyone had strengths and weaknesses and you should only be judged on your actions. I learned that women can be strong, carry a blaster, overthrow a government, and help destroy a death star. I dedicate today and tomorrow to my princess, Carrie Fisher. Crafting and creating can be therapeutic for a lot of people including me. So today’s post will be about the things you can create. 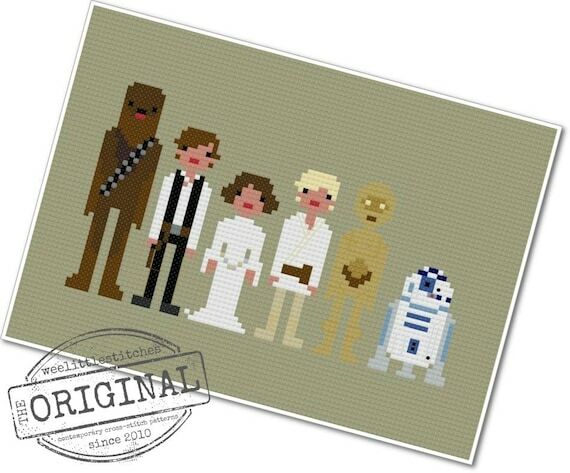 FreudianStitch created this cool Cross Stitch pattern you can download for free! 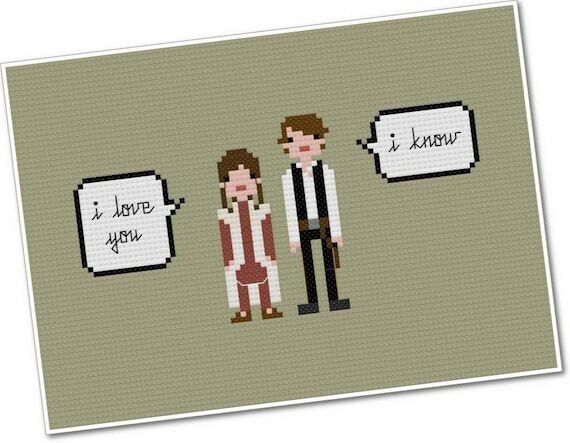 If you Crochet, here is a Princess Leia Amigurumi Pattern. 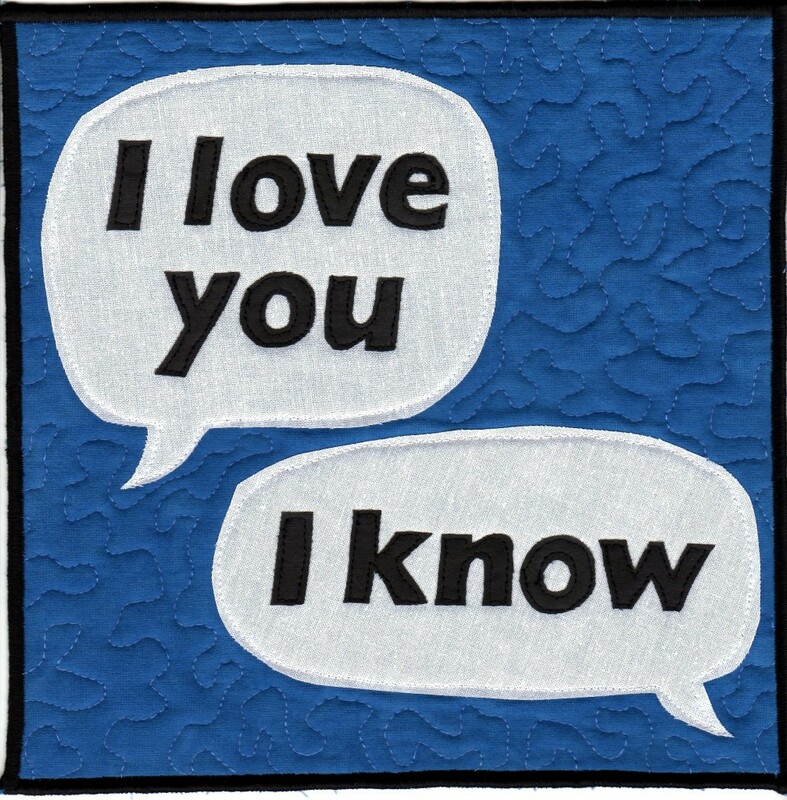 If you are a quilter and can paper piece, here is a free design from Quiet Play. Finally, if you sew or are a cosplayer, here is a step by step tutorial from Costumes and Artwork. Tomorrow I will share some of my favorite artistic projects I have seen over the years. Like Beauty and the Beast, self employment and the holidays have a very complicated relationship. This is often a time of money making, but it is also a time of family. If you’re like me, then even when you have done a lot of what you need to, you still feel guilty taking time away from your work over the holidays. Add in lack of sleep, travelling, trying to find time and money to get all the gifts that you need to, sleeping in beds that aren’t your own, and the general blahs that can sometimes come by virtue of the lack of sunlight, or the holiday season in general, and you can have a pretty rough time without realizing. So I wanted to take a post to remind all of you how important it is to make sure that you give yourself a break over the holidays. If you have orders, if you can get them done before hand, do. But, make sure to check with clients when they need things as you might find that some aren’t on a timeline and may be more understanding with the time restrictions during this time of year. Knowing that your client is flexible can take a huge load off, and keeping them in the loop about your schedule will help to keep you from feeling guilty about it. Remember, that even though you might not be able to take a full vacation, giving yourself a vacation from obligation for a couple days is super healthy and really needed around this time of year. To that token… here are a couple DIY relaxation remedies that will help. Spirit Sister gives you three recipes for cosmetic pick me ups that will help relieve your winter stresses, all while doing it on the cheap. Check out her moisturizing avocado face mask and her sugar lip scrub to help relieve some of the physical symptoms of winter. Taking care of your body when the weather is out to get you is a good step to taking care of the self. Also a must to check out is The Plant Strong Vegan who gives recipes for four steps to self love that are especially important at this time of year. Please check some of these out as there are some great recipes linked into her page and some good ideas for taking a load off after going through one of the most stressful (though fun) seasons. Your crafting business is only as healthy as you are, both in mind and body. So be kind to yourself, and remember that you absolutely deserve some time to replenish your energy and gather yourself for the coming year. This has been a year. So much has happened in 2016, it hardly feels like it could contain it all. Now is the time we usually get introspective and think about what has come before and what comes next. I’m doing more of that than usual. As this year comes to a close, so does my time blogging here at Craft Hackers. 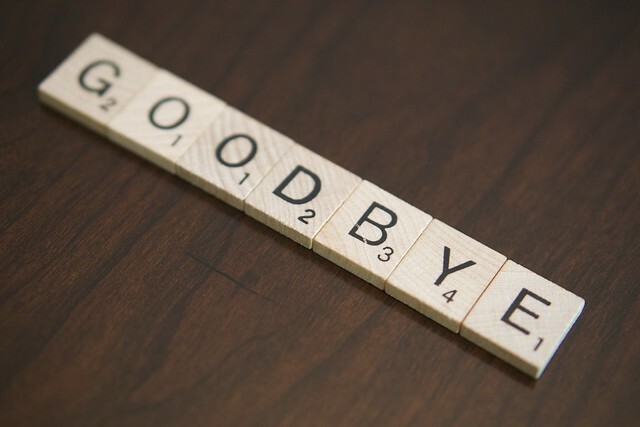 I have enjoyed the opportunity given to me, and I will still be around as a Member if anyone would like to contact me, but I am stepping away from the blog for personal reasons. I hope to be able to find time in the future to come back and continue our journey through cosplay and craftdoms, but for now, I will be focusing on things that I Need To Do. Best wishes for the coming year and all your crafty projects! 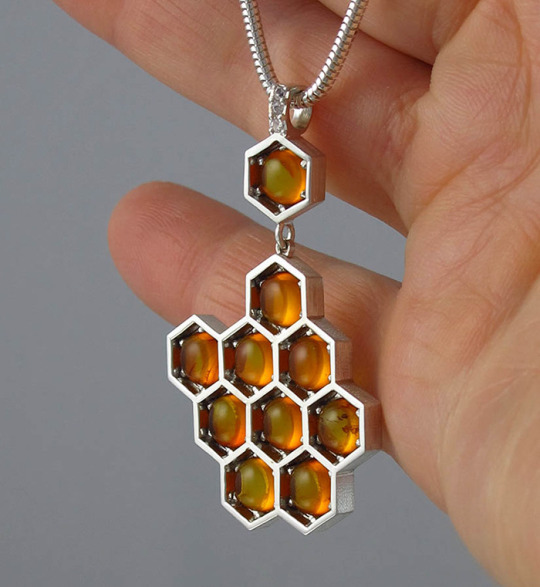 Using amber, white sapphires, silver and 14k gold, these designs are probably the most expensive pieces of jewelry I’ve ever show cased, but also some of the most adorable. 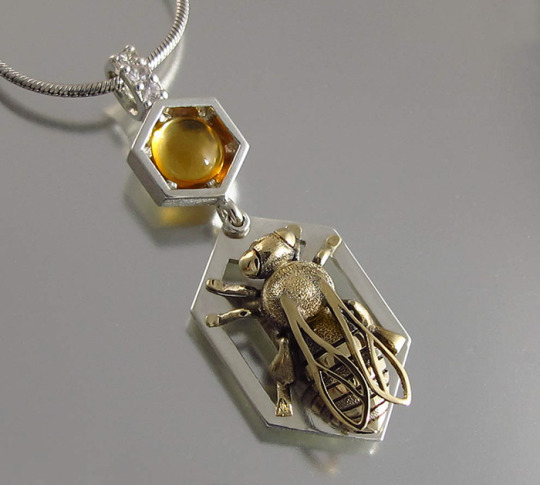 Designed and created by Natalia Moroz, these adorable honeycomb jewelry pieces were inspired by her childhood. The citron stones do still give that lovely honey color, but there’s something to be said for the nature of the amber as well. You can see flecks of debris stuck in the stones that I think pairs incredibly well with the theme. All of their jewelry if handmade in North Carolina (and not all of it is bees) so you should definitely check it out over on their etsy store; Winged Lion. For those that celebrate Christmas, today is Christmas Eve. Need a last minute gift? 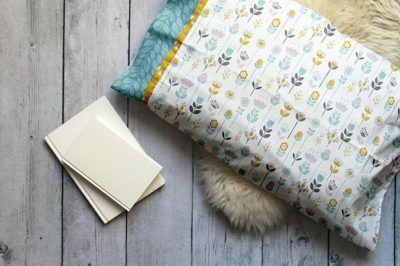 Here are some great easy sewing projects you can make that will make your loved ones smile. I hope everyone has a wonderful weekend and a Happy Holiday no matter what you celebrate! I announced last Thursday the special quilt I made for this years Magfest raffle, the Link Stained Glass Quilt. It was the brainchild of Nicole (the Monday/Tuesday blogger) who designed and drew the pattern. I used the applique Stained Glass technique and took pictures after every step. Here is the creation of the quilt from start to finish. This will be the only time I make this quilt, so it will be a super limited edition! To buy a raffle ticket and a chance to win this quilt, make sure you swing by the Craft Hacker booth at Magfest! Oh, and I made a Patreon! Like our patterns and want them before anyone else? You can pledge to get them! You can also receive a package of my scraps once a month as well! Don’t want either of those but want to support me? I also have a $1 and $5 a month tier to show your support. This Patreon will allow me to start filming and live streaming for both Quiltoni and Craft Hackers! So if you want to start seeing videos and live streams, please pledge your support today. I come to you with a tutorial with an old recipe, one that can be used both for kids an adults and can be a super cheap alternative to dressing a tree with expensive ornaments. That’s right, make your own ornaments. These can be done with kids and they will look rustic and cute, or you can transform them with some glitter or metallic sharpies into some very chic designs. I’ve taken the tutorial from Wholefully (please click to find some more detailed photos), but there are many recipes floating around, and you can ask your mother, she might have one too. You will need some simple tools that you’ll find in the kitchen – like a rolling pin and parchment paper, as well as baking sheets – but you’ll also need some holiday shaped cookie cutters (or if you just want to cut your designs or cut circles using a cup, you can) as well as either painting or drawing materials. 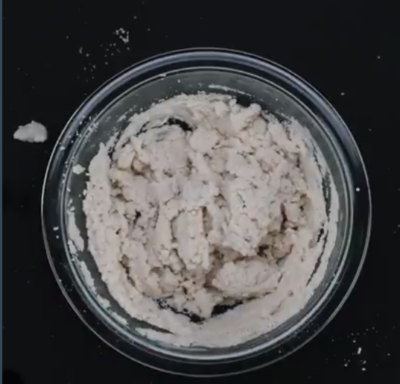 To prepare, you’ll basically be making a rolled cookie dough which is made with 4 cups of all purpose flour, 1 cup of table salt, and 1 and 1/2 cups of warm water. 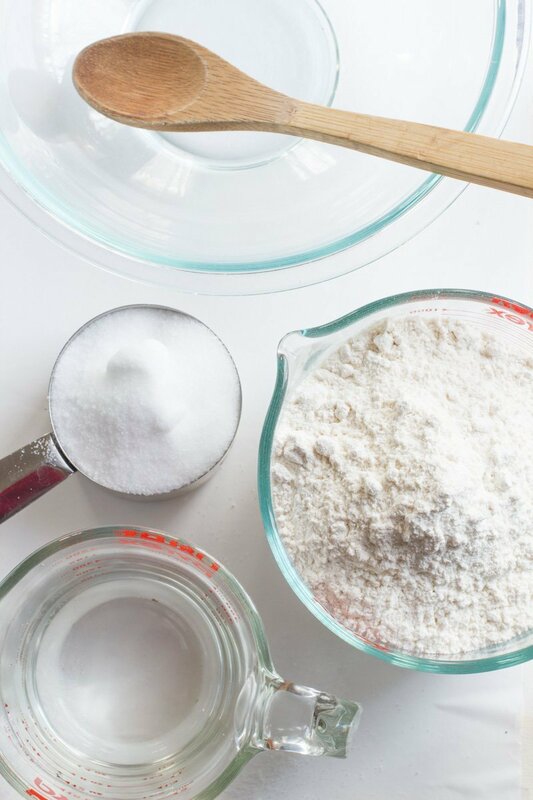 To make your dough, mix together the flour and salt in a bowl and then slowly pour the warm water into the mix and stir as you go. Keep stirring until all the water is gone, and when that happens you should have a very stiff dough which you will need to knead with your hands for a few minutes until the dough is smooth and pliable, almost like a pizza dough but stiffer. 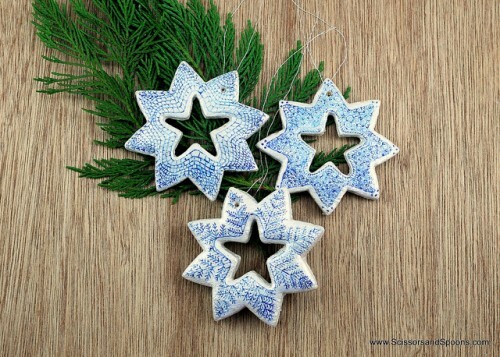 Keep in mind these will make white ornaments. 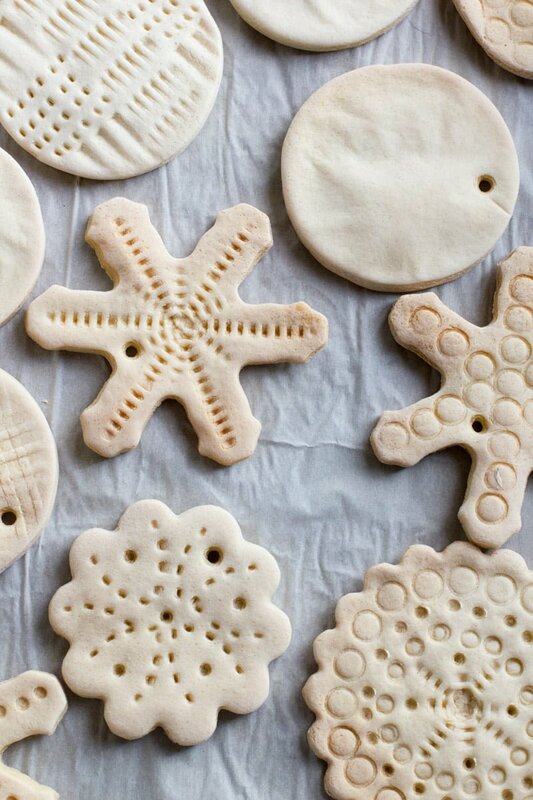 If you would like to have coloured ornaments, you can separate your dough and add food colouring to small portions. It’s up to you. Next, take a piece of your dough and sandwich it between two pieces of parchment paper. 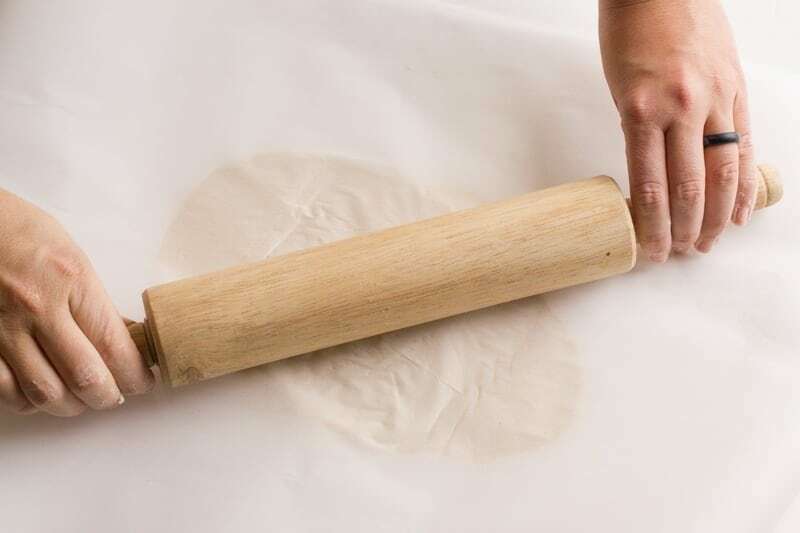 Make sure the paper is large enough and roll your dough until it is 1/8th of an inch thick. 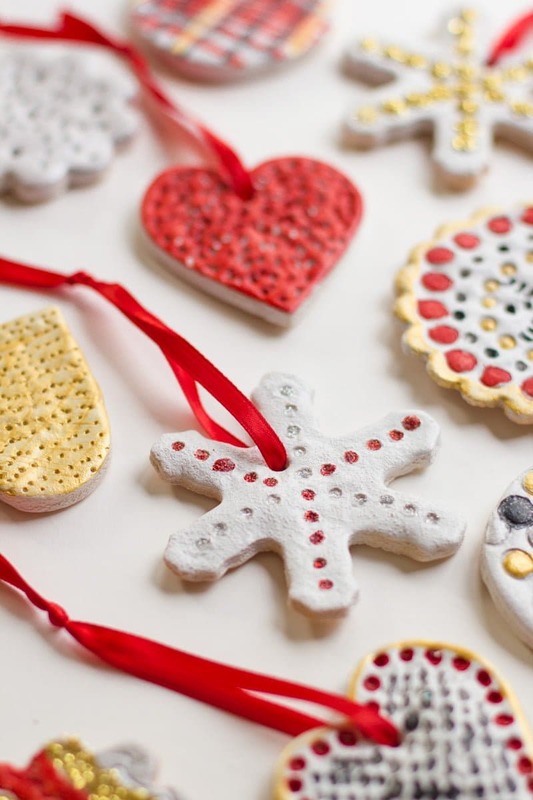 You will want to make sure they stay on the thin side as if the ornaments are too thick, they will break more easily due to air pockets in the dough. 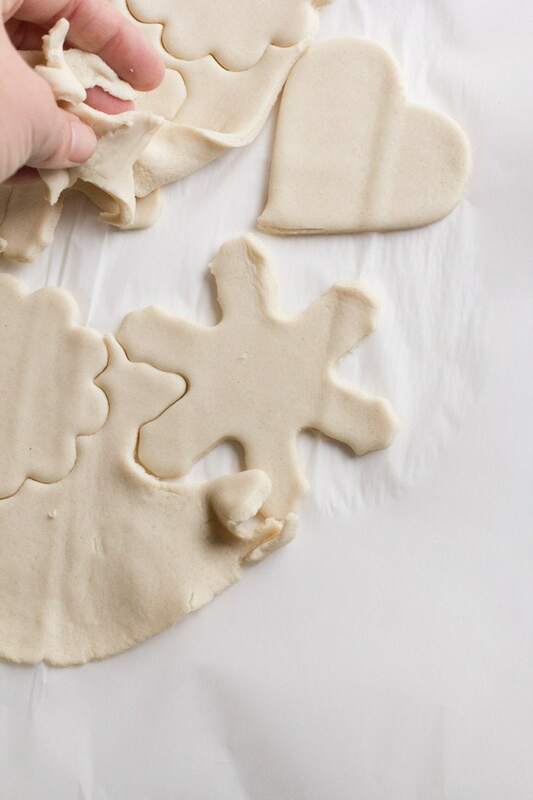 Remove the top sheet of parchment and use your cookie cutters to cut shapes into your dough. When you’re finished, keep the pieces on the parchment, and just peel the edges away. You will want to make sure to take a straw to make a hole in your ornaments before you bake them so that you can hang them. 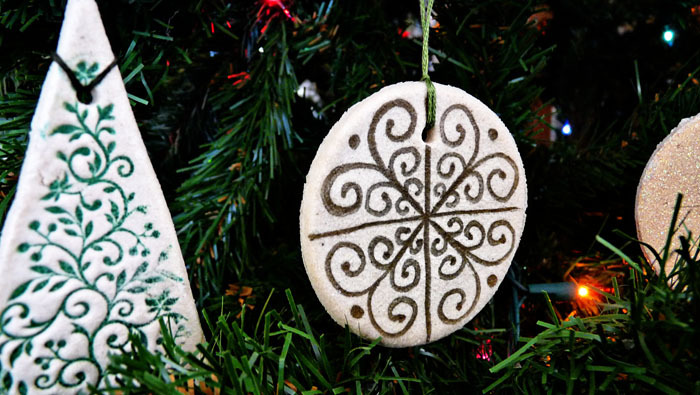 If you want to put texture on your ornaments, you can do it here – pierce it with a fork, put fingerprints, use rubber stamps – be creative! Transfer the whole sheet of parchment paper onto a baking sheet, and bake in a 300 degree oven for about an hour. You will know they are done as they will harden. They will be a bit overdone if they turn brown, but you will be decorating them so it’s not something that can’t be hidden. Once they’re cooled, you’re ready to decorate. 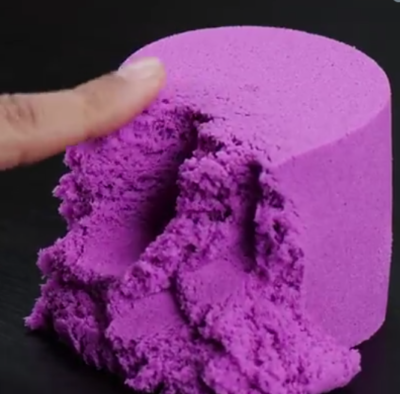 You can spray a coat of white paint as a base, or you can start decorating them right on the dough.You can use acrylic, tempra, puffy paint, you can use glitter, glitter glue or metalic sharpie markers. You can really decorate them however you’d like, and after you’re done, you just need a sealant (like mod podge) to make sure that they’ll keep – you can do either matte or glossy finish, whatever you prefer. Slide in a ribbon and hang! There are so many different options that you can do, and here are a few images to inspire you! From Shelterness, dough that was decorated with plain old blue pen and acrylic spray paint. I’m recently back from Germany, and so the news out of Berlin this week has hit me quite hard. This post was prepared before the tragedy struck, but I just felt I had to say something. I was not feeling the holidays much this year until this trip and the Christmas markets of Dortmund and Düsseldorf. Christmas markets are one of the most wonderful things you can do during the holidays. Crafts, gluhwein, good friends, and fun in the cold. What is there not to love? It is awful to think that such horrifying attacks could happen at such a place of fun and joy. But rather than be defeated by the terror and anger, we must soldier on. I love the German Christmas aesthetic. My mother has always loved it, and some of my favorite ornaments in her collections are German. I do love my woodworking, and a lot of the Christmas ornamentation and crafts I found at the Christmas markets were wood-based. But one of the best was Käthe Wohlfahrt. to the tiny handcrafted ornaments of cuteness. The quality of the craftmanship of Käthe Wohlfahrt is exceptional. In today’s world of mass-production, it is a joy to see unique and interesting options still out there, thriving. Whatever your holiday aesthetic, let it be of cheer, let it be of joy, and let it be a light in this dark winter to drive away the sorrows and pain to lead you to better days. It should be able to hold form, but not look soupy. This is a bit of a personal preference level as well. 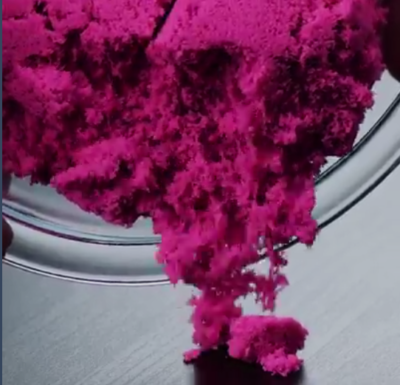 Speaking f personal preference, you can now add food coloring to the sand if you wish. About 1/2tsp to 1 tsp should be more then enough to get a nice vibrant color. Once your sand is the color you want, set the bowl aside to let it dry for 1-2 hours. When you come back, it will be like magic.